B.Sc. (Hons), MB., M.Sc., F.R.C.S. (Eng), F.R.C.S. ( Tr & Orth). Spinal Care Specialist Ltd is run by by Mr David Chapple, Consultant Orthopaedic and Spinal Surgeon at Salisbury NHS Foundation Trust and at New Hall Hospital, Salisbury, Wiltshire. He is a Consultant Spinal Surgeon for the Duke of Cornwall Spinal Injuries Treatment Centre. Spinal Care Specialist Ltd is able to offer a complete diagnostic and treatment service for all types of spinal condition. Mr David Chapple qualified at St Thomas’s Hospital Medical School in 1990. He trained as a spinal and general orthopaedic surgeon at St George’s Hospital Medical School, London and completed a specialist Spinal Research and Surgical Fellowship in at The Royal Adelaide University Hospital, Australia. Mr Chapple is actively involved in teaching of undergraduates, postgraduate students, junior doctors, training and supervising a team of GPs with a special interest in spinal surgery and training and supervising extended scope practitioners (physiotherapists). He is involved with multidisciplinary team training with other medical specialities. He is an examiner for undergraduate medical students and specialist registrars. Mr Chapple undertakes a full portfolio of continuing professional development. This involves annual peer and management appraisal. He attends and presents at orthopaedic and spinal meetings in UK and internationally. Mr Chapple is a member of the AO Spinal Fellowship. He is a member of British Scoliosis Research Society. 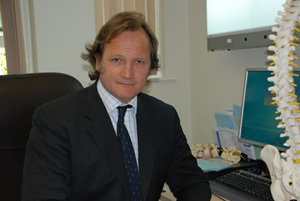 He is a member of British Orthopaedic Association and has been an NHS and Private Consultant in Salisbury since 2001. Mr Chapple has special interests in lumbar and cervical spinal conditions, motion preserving surgery (disc replacement) and vertebroplasty. He is a trustee of Horatio’s Garden Charity and the Southern Spinal Injuries Trust.